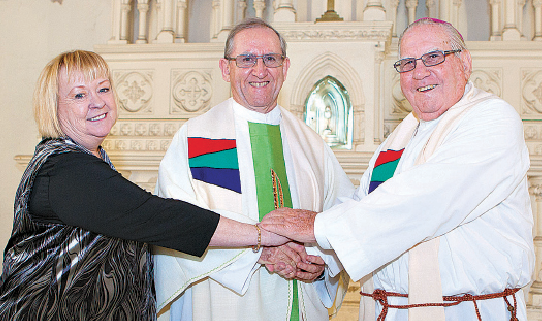 CATHOLIC Psychiatric Pastoral Care chaplain Fr Jim Smith is one of five priests from the Banyo Seminary class of 1973 who this year celebrate 40 years since their ordination for the Brisbane archdiocese. Fr Jim celebrated the 40th anniversary of his ordination with a Mass with CPPC at St Patrick’s Church, Fortitude Valley on August 9 – the date of his ordination. Fr Jim entered the seminary in 1968 at 21, which he said was considered “a late vocation”. He studied to become a teacher after receiving a Commonwealth Scholarship to study a Bachelor Arts and a Diploma of Education at the University of Queensland. It was during his university holidays God revealed a different plan. “I used to go to Mass everyday during the university holidays and I used to pray to God to reveal his will to me,” he said. “God started to lead me to consider the priesthood. “And that’s what I did. “It’s God’s call, it’s not our decision. Fr Jim said different members of his family had a great influence on his own Catholic faith. “I can remember my grandfather, my father’s father, who when I was at school, would walk to the church and do his Holy Hour faithfully,” he said. “My grandmother, my mother’s mother, would walk to Mass with me when I was an altar server. “I wondered ‘who do become priests and religious’? “Most notably are the CPPC family – Mrs Janine De Maria, the co-ordinator of CPPC for the past 27 years, the priests, the pastoral carers, the members, the staff and so many supporters – so many of whom were present at the Mass on the August 9,” he said. “People with a mental illness are an inspiration. As for advice on discerning a vocation to the priesthood, Fr Jim said to “let it come from God”. “I can’t tell you how God will do it, but I’m always saying to people to pray and God will come up with the vocations,” he said. “God has solutions that you would never dream of because he’s God – he has a wisdom all his own.